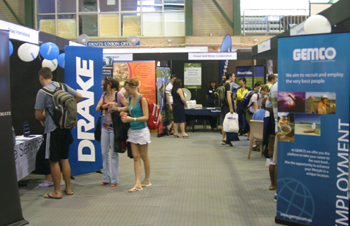 Charles Darwin University’s Graduate Recruitment Fair turned out to be a bigger and better attended event than previous years. More than 30 international, national and local firms set up their stalls on the Casuarina campus basketball court on April 3 in the hope of drawing potential employees to explore what their company had to offer. Most firms reported a lively response, many saying that the early scheduling of the Fair was advantageous in helping students gain an awareness of employment opportunities at the start of their studies for the year. Last year, for instance, the Fair was held later in the year – with a smaller turnout of students. Firms such as consulting engineers Sinclair Knight Merz, said that many students made inquiries about work experience opportunities. ‘We were able to tell them that work experience was available, and that was possible to gain experience interstate with national companies,’ said Sinclair Knight Merz engineer Claire Pocock. ‘We want students who are proactive, because work experience may lead to employment if you impress us. So the students should take their work experience very seriously,’ she said. 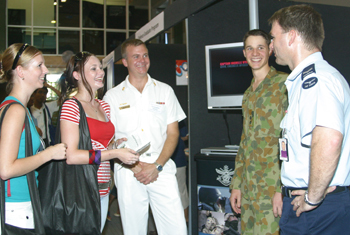 Holding the Fair at this time of the year brings CDU into line with most other Australian universities.